One of my biggest anguishes I've had about getting hit with a herniated disc has been my inability to participate in my town's annual half marathon. But as I recovered from this affliction and started to run again I began to think that perhaps my fears on that front were premature and I could at least try the race this year. So I decided to register for the event next week and give it a shot. My running performance hasn't been anywhere near before my injury. I jog slowly about 4 or 5 miles depending on my condition every other day and I've learned to be satisfied with that. Running 13.1 miles has been such a distant goal that I knew I was deluding myself about running, let alone finishing, this race. Then to add insult to injury I got hit with another blow to my back yesterday. I must have over-extended myself lifting heavy bags after grocery shopping. Those with back pain know what I'm talking about. As you begin to straighten up you feel the dreaded pop in your back followed by the pang of sharp pain. It's unmistakable and it's the beginning of yet another bout with extended back pain. After muttering a few expletives under my breath I realized that this was the kiss of death for next week's half marathon. Just my luck! Oh well, perhaps this was a sign that I should accept my condition and avoid strenuous activities. Yet there's that stubborn part of me that just won't capitulate. So after a painful night, I popped two Advils today and decided to pay a visit to the half marathon course to evaluate my condition. I planned to run the course as far as I could and then quit at the 7th mile or so, if I could get that far. Right from the start the back pain kicked into high gear and kept hounding me to stop. "No way," I thought to myself and I kept on going with pain piercing my back and pins and needles radiating down my legs. I wasn't about to let the pain force me to quit. As I passed every mile marker already painted on the course, I said "one more mile" and pressed on. As I reached the 7th mile, I had a sudden realization that I've made it this far, might as well finish the darn thing. The temperature was mild but humid, pain was my only companion, and there were no water stations to get hydrated, but finish I did. When I incredibly passed the finish line, I continued for another fraction of a mile as a sort of a victory lap. Dehydrated, exhausted, and pain-ridden (and not just in my back anymore), I got in my car to drive home, dazed at what I had actually done. I hadn't stopped even once. It was one smooth jog from beginning to end. I'm not sure if this was a case of mind over matter or just a foolish act to defy my own body and prove a point. Whatever the case, I learned that the human body can sometimes be pushed beyond its perceived limits. The jury is still out on whether I can repeat the performance next week at the race. On top of that I might have aggravated my condition today. But even if I can't, I know I ran the half marathon even before the starter pistol's trigger will have been pulled. It's been nearly 6 months since I was diagnosed with a herniated disc. During that time I have had to make some lifestyle changes, but looking back, the adjustments haven't been as drastic as I might have feared initially. Or perhaps I am now just used to dealing with the condition. When I was in the throes of the torturous pain, all I could think of was that my life as I knew it had ended. There would no longer be any running, no motorcycle rides, no hiking and no getting in and out of the car without the excruciating pain. Fast forward 6 months and those dramatic changes I was afraid of didn't quite materialize. There has been some changes to be sure. No lifting of heavy objects, no fast running, and occasional pain in the lower back and down the leg to contend with. But with daily exercises, sleeping on a hard surface, and avoiding long periods of sitting, I have been able to reclaim some of the freedom I used to enjoy. Thankfully, so far I have been able to avoid steroids shots or more drastic measures like surgery. I have done quite a bit of research during this time and realize that many people aren't as fortunate as I have been, but at the same time many others live normal lives with their herniated discs. As far as I can tell and as explained by my doctor, the herniated mass has probably shrunk with time, relieving the pressure on the spinal cord and affording me more freedom of movement. That is not to say that I am completely pain-free. There are occasional bouts with pain and discomfort which I manage with patience and a few doses of pain killers. But generally, I have resumed a relatively normal life. The prospect of another attack is on my mind every day, but I try not to let it rule over my life. My approach to my condition has been not to succumb to a state of hopelessness. It's difficult not to, but after accepting the situation, I decided that the best way to manage it was to continue with my activities the best I could. Ditching the bed for a thin pad on the floor has helped. So have daily back exercises and conditioning. As much as I wanted to continue with my running routine, I initially down-shifted to walking. Even that was painful at first, but as time passed I was able to slowly incorporate some jogging in my daily walks until I was ready to completely switch over to jogging. On good days, I would increase the distance to 4 or 5 miles. Currently I'm on alternate days of jogging and walking and that has been relatively steady. I have also learned not push it too far. When there's pain during a jog, I heed my body and slow down to a walk. There's no reason to be stubborn and risk paying a big penalty later on. The point is that if you are an active person who has suddenly been struck with a herniated disc don't lose hope and wallow in grief too long. It doesn't have to be all or nothing. There's always a middle ground. Accept what has happened and then make the right adjustments to battle your way back. You may never be the same as before, but concentrate on what you can salvage rather than fussing over what has been lost. I saw my doctor today and the diagnosis was as I had expected. I indeed have a herniated disc. 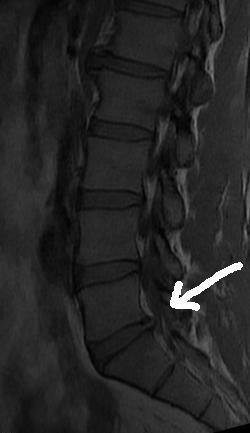 Nicely ruptured, spilling material into the spinal canal, putting pressure on the nerve. At least I have confirmed results on the source of the pain. For now I'm on steroidal medication, Prednisone, 4 times a day. I suppose guessing the results in advance helped to ease the bad news for me. I actually went for a slow jog last night and this morning I was experiencing some moderate pain, so I had a couple of Advils in the morning to dull the pain. My doctor was pretty nonchalant about the whole event and that gave me some confidence in my prognosis. I suppose doctors see so many similar cases that they become rather accustomed to them. Other than the steroid pills, I am free to continue to with my activities, including jogging, as long as I don't have a great deal of pain. This week's nominal pain is nothing compared to my condition in the past couple of months, so I'm thankful for that. I know that my herniated disc will be with me for the rest of my life. But as long as the pain is kept at bay, I can live with that. It's not like I'm in my 20's anyways. This is just a part of mid-life and I have to be prepared to deal with lots more problems than a herniated disc as I go forward. That I'm sure of. If you are an avid runner, you know that occasional pain is just a part of the activity. It comes in different intensities and it affects different parts of the body. Sometimes it's in the knee, other times it's in the foot, sometimes it's from a strained muscle, and other times it's in a joint. Take a look at my recent MRI and it's not hard to tell where my pain was coming from. Even my kids had no trouble spotting it. Mind you, my doctor is yet to see this on my next visit, but odds are he'll zero in on this anomaly too. The ordeal started about 4 months ago. At first it was a pulling and tightening sensation in my left hamstring. As time progressed it became painful, specially on long jogs and the hilly parts of my route. I would just attribute it to a strained muscle, yet strangely the hamstring was not tender to the touch. The discomfort would eventually subside, but kept returning with more intensity after each run. In my mind something was clearly wrong, but not bad enough to seek medical help. Then 2 months later my body decided to send a stronger signal, in the form of a nasty lower back pain. I've had lower back pain before. They would normally hit me every couple of years, and eventually go away after about a week. I would just ignore them and continue with my daily activities, including running. But this time the pain had no intention of leaving. In fact it kept worsening to a point that I could barely even walk. The hamstring pain was still there, but I was yet to connect the dots. My orthopedic doctor, however did make the connection when I finally decided to pay him a visit. An X-ray revealed no serious problems, so I was given some conditioning exercises, some anti-inflammatory medication and a follow up date. Slowly the pain began to subside and I started to resume my normal life and running. But a couple of weeks later, just before leaving for a week-long business trip, the pain returned with a vengeance. This was the worse trip I had every been on. There I was in Miami Beach near the beach where I should have been running after work. Instead I was nursing a debilitating pain. I couldn't sit, I couldn't stand, I could barely walk, and I still had my job to do. Things became even worse when I returned. Getting in and out of the car became a long exercise in pain. Turning in bed at night meant a certain wake-up with a piercing pain. Advil became a candy of choice in copious amounts. Finally I called my doctor again to see him before the follow up date. He discovered a distinct weakness in my left leg as compared to the right one. I believe this condition is known to some as Sciatica. He suspected a herniated disc and ordered an MRI scan, which took place yesterday. The MRI (Magnetic Resonance Imaging) machine is truly a marvel of medical technology. It can virtually slice through the body and record images from multiple angles while the patient feels absolutely nothing, except his original pain that brought him there in the first place. Claustrophobics would certainly find the process disconcerting, as do people like me who can't hold still for even a minute. When I had to lie still in that loud coffin-like contraption for some 40 minutes, the desire to move became even more magnified. I don't know how I lasted that long, but somehow I managed to stay still the whole time. Moving around probably would have meant having to stay longer in there for re-scans, and my goal was to escape the mechanical beast as fast as possible. At the end of the session, I was given a CD-ROM to hand over to my doctor on my next visit. I hadn't intended to browse the CD, but by the time I got home, curiosity (both technical and medical) got the better of me and I started to browse the images. Many of them made no sense to my untrained eyes. I could almost make out the position of the sliced images, but they all looked like a mass of chopped meat to me, until I got to the length-wise sliced images. As I looked closer, I finally spotted the damming evidence, which I have indicated above with a white arrow on the image. Yes, that's really my spine. I'm no doctor (although I am a son of a darn good pediatrician), but this looks like an unmistakable culprit to me. It may be a herniated or bulging or protruded or slipped or ruptured disc, but it's easy to see how it's pinching the nerve between the L5 and S1 vertebrae. Ok, I googled their names. Obviously my doctor will have the last word on this when I see him next week, but this evidence is hard to contradict. The good news is that I know the cause of the pain, and the bad news is that I know the cause of the pain. Could this mean the end of my running days? I don't know, at least I hope not. For now I have replaced jogging with the much gentler walking. As depressed as the thought of not running makes me, there's no need for me to dwell on it and become inactive. Life is filled with all kinds of obstacles and personal disappointments. Whatever the case here, mine can be no worse than others'.